When I was just four years old, I was already the kid that would eat almost anything if it tasted good. As the other children in preschool refused to even touch the broccoli cheese casserole with their forks, I pretended to push it around in disgust too (stealing bites of it when no one was looking). I wanted to shout, “Hey guys, I know this looks disgusting, but it tastes really good!” However, the social taboos of the pre-kindergarten gang kept me quiet. I was hanging out at my best friend’s house one afternoon when I spied a bowl of hideous-looking fruit on the counter. They were pears, but not like the blushing green or red ones at my house. They were a flat russet color and looked like a lopsided potato. When my friend’s mom offered one to me I wasn’t sure, so she told me to smell it. The aroma shocked me, like ripe and sweet perfume. The first bite was creamy, soft and a little grainy. It tasted like it smelled, only even richer. 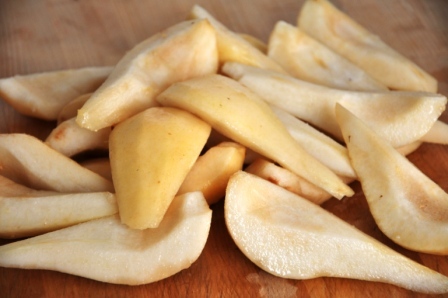 I have been a fan of the Bosc pear ever since that day. They certainly aren’t going to win any beauty pageants in the produce aisle, but I’m not worried because if other people don’t notice ‘em, that just means there’s more for me! 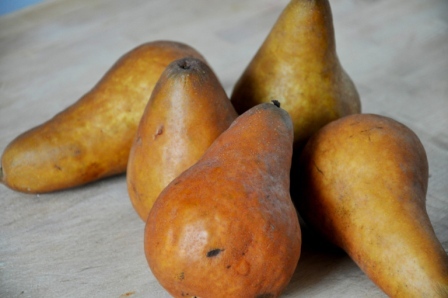 Not unlike avocados, these pears are heavenly when ripe, but when immature they are crunchy instead of creamy, odorless, and the flavor is pale. You have to buy them a few days before you plan on eating them, just let them sit on the counter at room temperature. When ripe, the flesh gives a little, the skin near the stem starts to wrinkle ever so slightly, and the pears give off a wonderful, heady aroma. 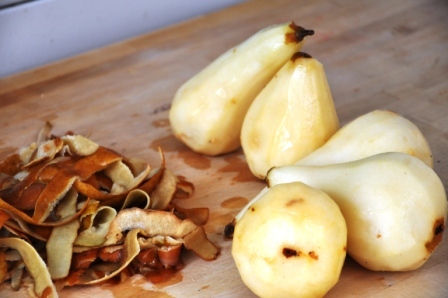 Now, if they’ve gone too far (like, they smoosh all over the inside of your coach purse en route to work, ugh) it’s time to forget eating out of hand and start thinking about pear sauce. 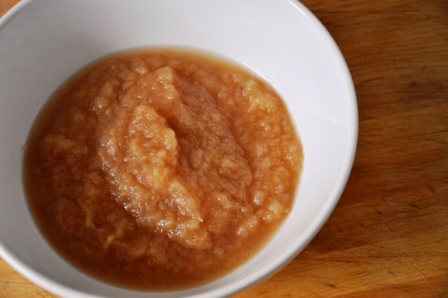 Like the prettier sister to applesauce, pear sauce is somehow more delicate, floral, and special than that made of apples. It couldn’t be any easier to make, and my version is made even more interesting by the addition of cardamom and lemon. Or not, if exotic spices don’t float your boat. What’s that you say? It’s brown, and looks a little like baby food? Yeah, you’re right, it does. But who cares, it tastes really good! Talk about versatile, this sauce is delicious on its own as a snack or dessert, but would be fabulous with a scoop of vanilla gelato or a swirl of tart plain yogurt. It would also make a fine addition to your morning oatmeal or as an accompaniment to some juicy, thick-cut grilled pork chops. Peel, quarter, and core the pears. 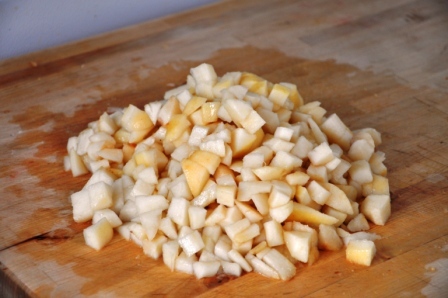 Cut the pears into medium dice and place in a sauce pan over medium heat. 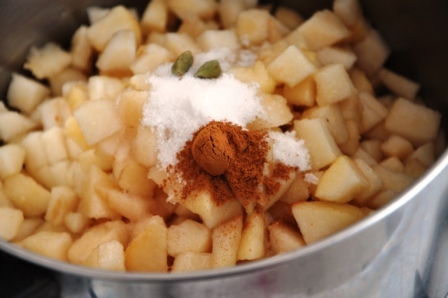 Add the sugar (if using), cinnamon, cardamom pods, lemon juice, and salt. 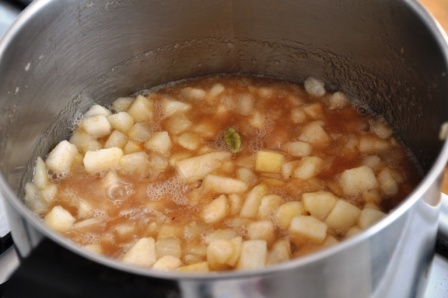 Cook until the pears are soft and most of the liquid has evaporated. At this stage you could serve the sauce, or use a food mill, potato ricer, food processor, or hand-held electric mixer to puree the sauce until it is as smooth as you like. Just remember to fish out the cardamom before you puree! Serve the sauce warm, room temperature, or chilled. It will keep for up to a week in the refrigerator. Maybe I should try it. Aasim’s favorite fruit is pears! I’m going to try it next week Em!! Yummy and I love your blog…go for it! Thanks Deb! Let me know how it turns out!